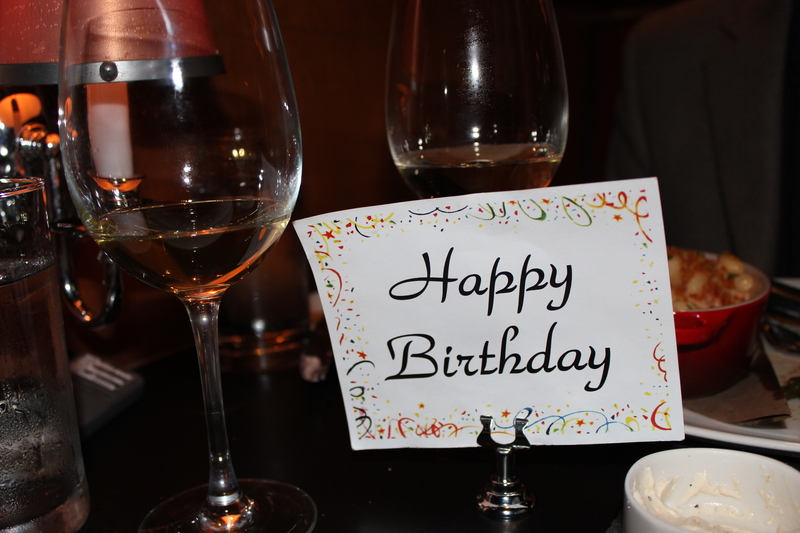 Back in October my husband celebrated his birthday and so we went out to dinner. 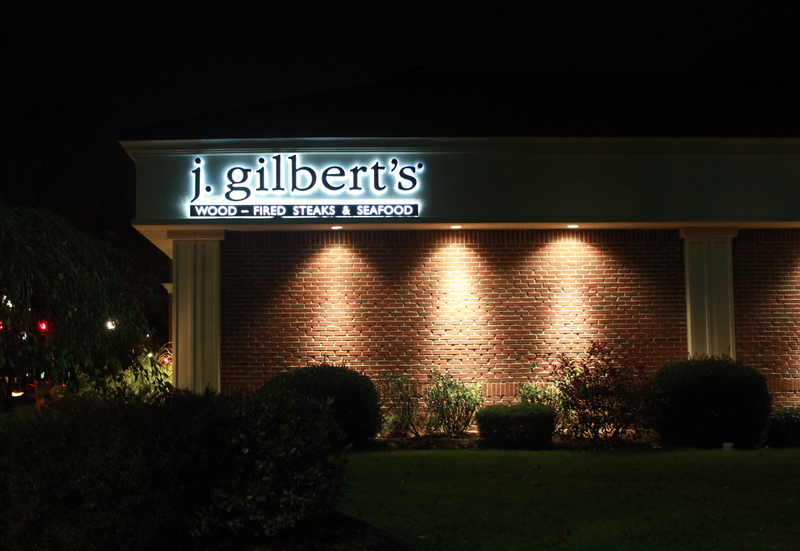 It was not a hard choice where to go because for his birthday Mr. D. had received a gift card from J. Gilbert’s and it just happens to be his favorite place to go for dinner out. They are best known for their steaks, and that suits Mr. D. just fine as that is what he always orders. I am more adventuresome in my choices, and have always been very well satisfied with whatever I have ordered there. 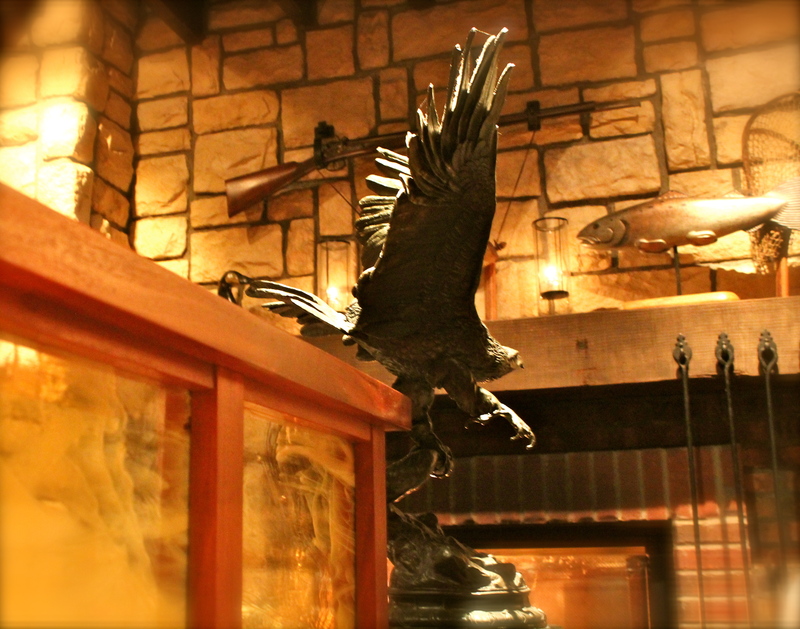 One of the things we like about J. Gilbert’s is the ambiance. It has a “clubby” type of atmosphere with lots of wood furnishings. Parties are seated in secluded booths with stained glass dividers, so there is a sense of privacy. The ambiance is cozy and warm. Even though the restaurant has a large interior, once seated you cannot see into other parts of the dining areas. 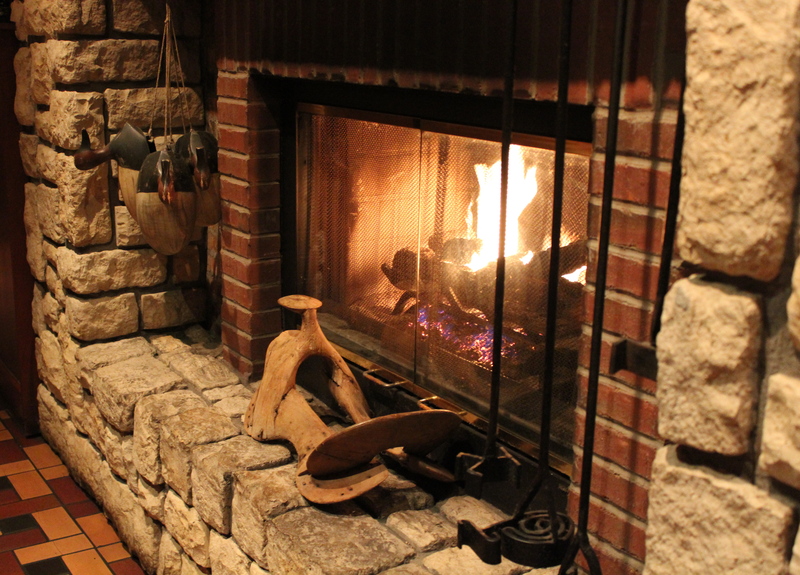 On this particular evening we were greeted at the door and escorted to our reserved table right near the massive stone fireplace where there was a gas-fire burning. The hostess placed a “Happy Birthday” card on the table so all servers and wait staff would know that we were celebrating a birthday. Everyone who came to our table wished Mr. D. a “Happy Birthday”. Even the couple sitting across the isle from us greeted us warmly and eventually offered to take our picture with my camera. Everyone knew we were celebrating a birthday. When our waiter arrived at the table to take our order he was well prepared to tell us about the evening’s special menu offerings, and to suggest an appropriate wine to complement our meal. We began with wine and the bread offering which was a small loaf of sour dough bread accompanied by sweet butter, and also an herb butter. We ordered our wine by the glass and I had a smooth, buttery California Chardonnay, and Mr. D. had a Sauvignon Blanc from New Zealand. Both lovely. Next we had our appetizers. Mine was the Caesar Salad, served with a crispy disc of Parmesan-Reggiano cheese that had been melted then allowed to become crisp. 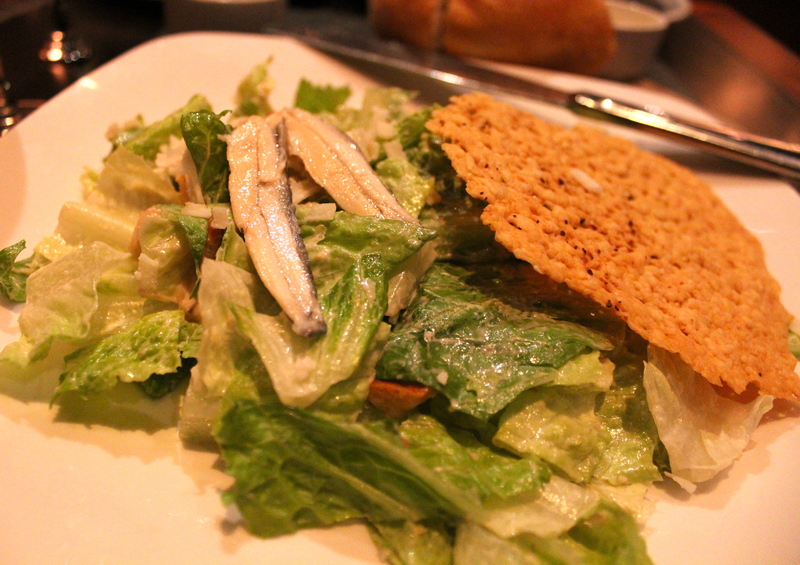 The salad was garnished with two anchovies on top. All the traditional ingredients of a Caesar Salad but put together in a non-traditional way. Delicious! Caesar Salad, garnished with two anchovies and a crisp disc of cheese. 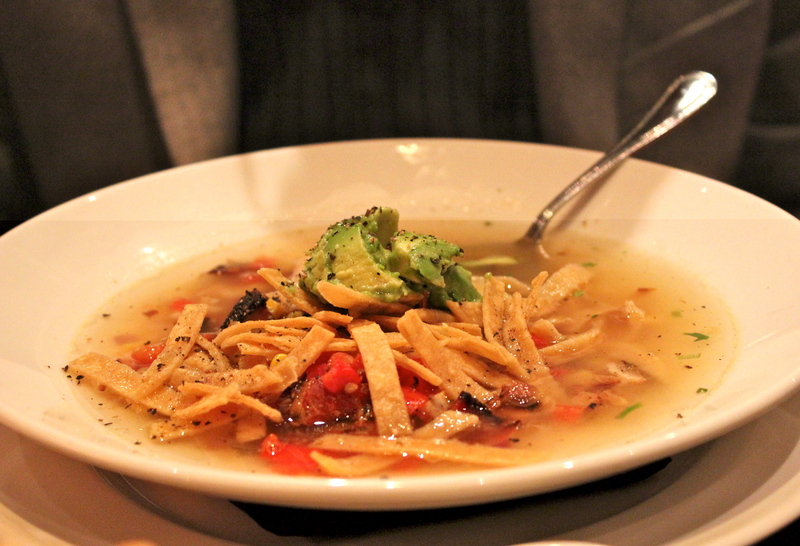 Mr. D. had the Chicken Tortilla Soup, a spicy chicken broth base with bits of chicken, and vegetables, plus crispy tortilla strips and garnished with a scoop of guacamole on top. He loves this soup and always orders it whenever we go there. Chicken Tortilla Soup, garnished with guacamole. For his entree my husband ordered the Kansas City Strip Steak, medium rare, and it was perfect. Along with it he had Lobster Mac and Cheese and Green Beans with Almonds. The amount of food was plentiful, and he took part of his meal home. 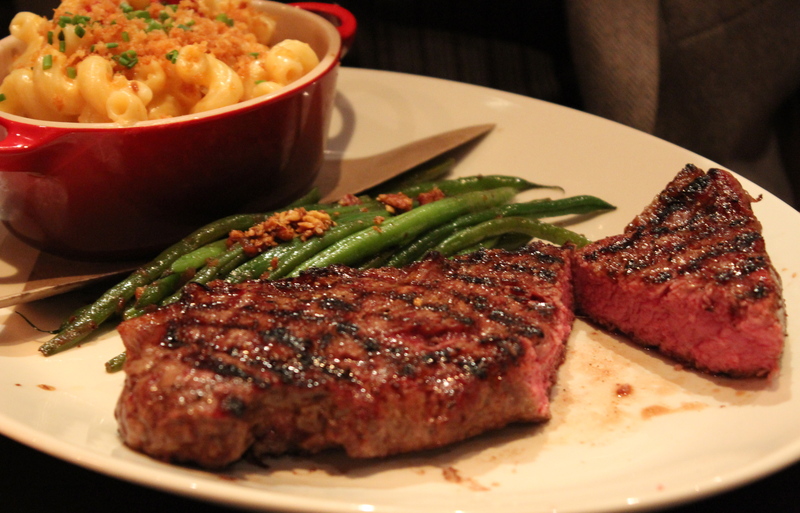 Kansas City Strip Steak served with Lobster Mac and Cheese and Green Beans with Almonds. 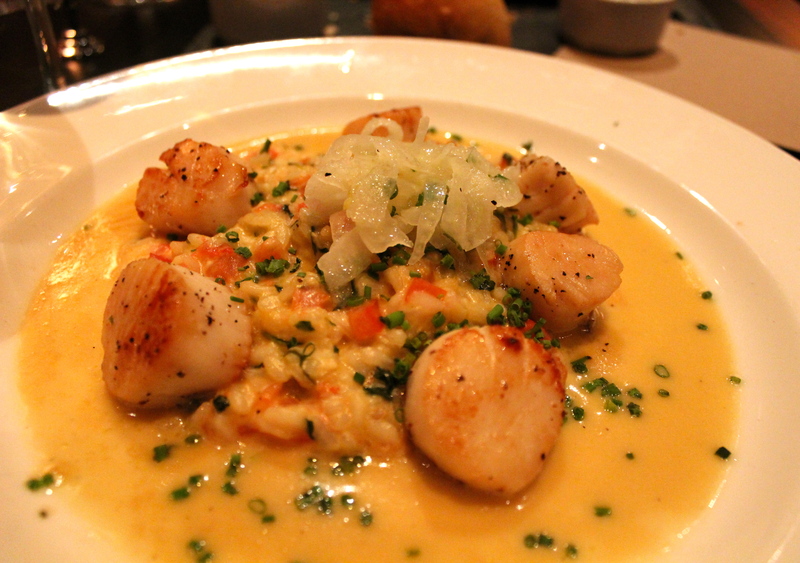 My entree was the Georges Banks Seared Scallops in a lemon butter sauce and served with Lobster Risotto. The risotto was garnished with lightly sautéed onion rings. It was beautifully plated and outstanding in flavor. The quantity of food was such that I was able to finish my whole dinner, but with little room for dessert. Georges Banks Seared Scallops with Lobster Risotto in Lemon Butter Sauce. Our waiter allowed us to take our time with dinner, with no sense of being rushed. At the completion of the main course, he presented us with a tray of dessert options from which to choose. We decided to share one dessert and chose the Creme Brûlée. When it was brought to the table, it was garnished with two raspberries one of which had a lighted birthday candle in it. 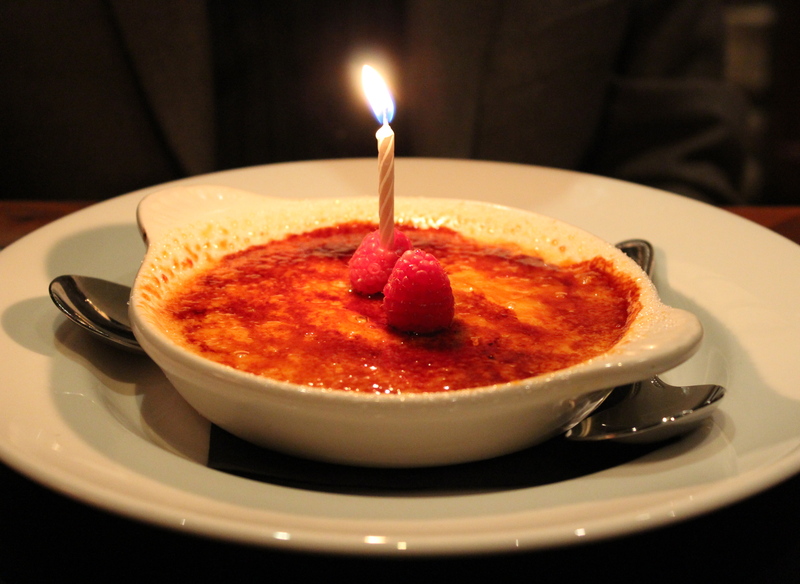 Creme Brûlée with a Birthday candle. Eating this luscious dessert was like eating velvet, it was so smooth, custardy and creamy, with a layer of crisp caramelized sugar on top. Along with dessert we had coffee. It was a wonderful ending to a great dinner and Birthday celebration. We tend to go to this restaurant on special occasions and we are never disappointed. All the meats are from grain-fed animals, and no hormones are used; the seafood is from waters off the coast of New England, never farm-raised. All produce is grown and sourced from nearby farms. The chef is creative in his use of seasonal produce, and presents traditional offerings with a slight twist. As you might expect for a restaurant of this caliber, the meals are pricy, with dinner for two costing not less than $100.00. However, we are always well-satisfied, so when we want to enjoy a leisurely dinner for a special night out, the cost is justified. I can whole-heartedly recommend this lovely restaurant to anyone living in the vicinity or to vacationers or travelers passing through the the central Connecticut area. 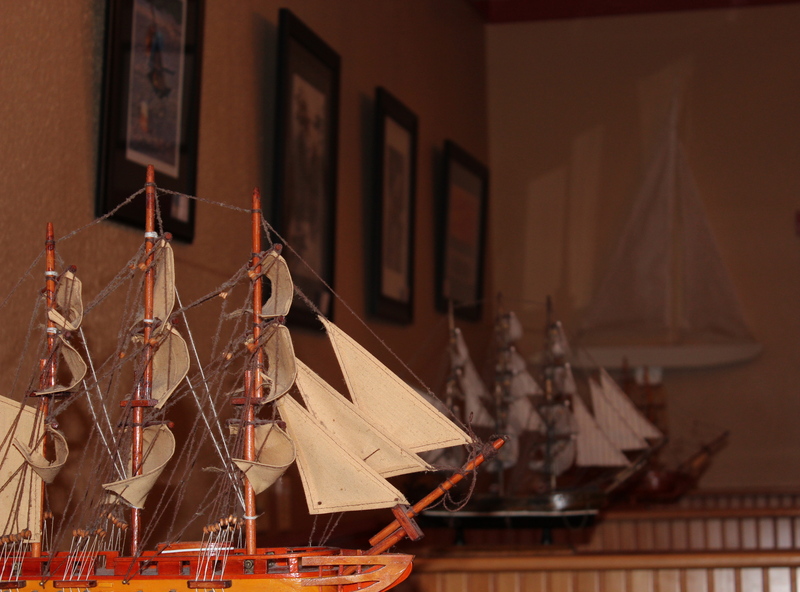 Model of a sailing ship near the front entrance. For a small city there are a lot of very good restaurants in New Bern, North Carolina. We had spent some time browsing in the shops, but they were closing for the day and we realized we were getting hungry. Deciding where to have dinner was a tough decision, because of the numerous choices, and because we had heard good things about so many of them. In the end the decision was practically made for us because we found on-street parking less than a block from M.J’s Raw Bar. Rain was on the way so it was a quick dash from the car to the door and we were inside. The interior is rather small, with the dining space longer than it is wide, The ambience is cozy and the service is friendly. Tables occupy the front near a large window that looks out on the street, while the rear portion consists of booths. Decor is decidedly nautical and “fishy”. Along one side the backs of the booths are each topped with a metal fish. 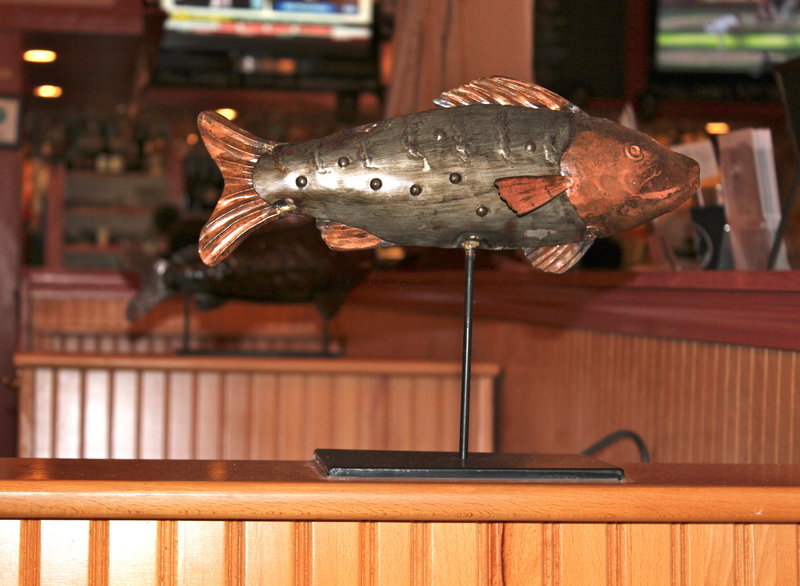 Metal fish sculptures decorate the backs of booths along the right side. Along the other side each separation is topped with a sailing schooner. The walls are lined with framed pictures of sailing ships. 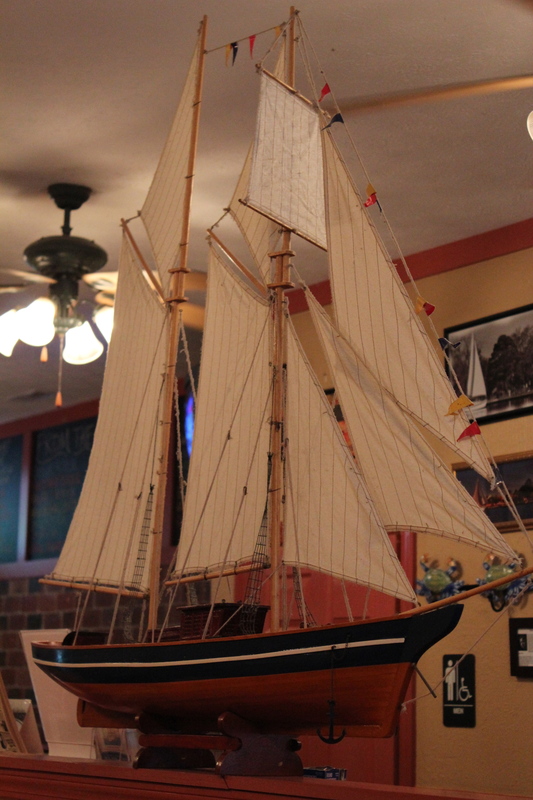 Models of sailing schooners decorate the backs of booths on the left side. We were seated near the front at a table for four where we could look out at the street scene. Our waitress, a southern gal, was very friendly and described the day’s specials that were in addition to the regular menu offerings. 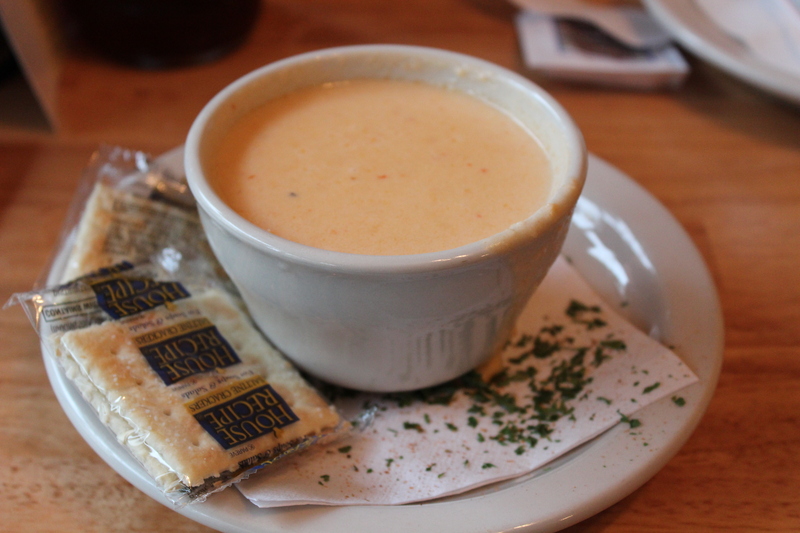 A cup of lobster bisque. The soup special was Lobster Bisque. This sounded especially good, so three of us ordered it as a starter. It was rich and flavorful, with lots of small pieces of lobster floating in the creamy broth that had just a hint of sherry in it. A cup size serving was ample as a first course, but my husband had the bowl size because he likes a lot of a good thing. 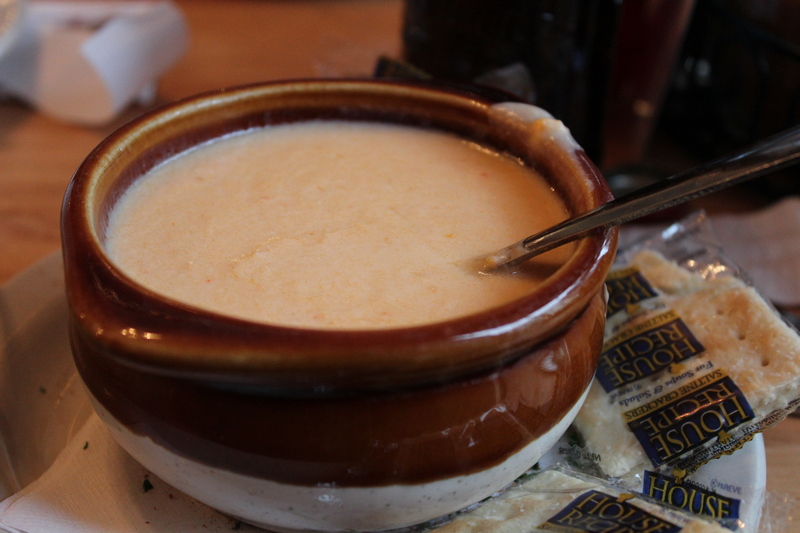 A bowl of lobster bisque. The fourth person in our party ordered the crab chowder. Of all the items we ordered this was least appealing because it was so heavily spiced. While the flavor was good, the “heat” and spice was too much to be enjoyable. Spicy chowders seem to be popular in this area, so it is probably an acquired taste. Amongst four of us we ordered three different entrees as two of us had the same thing, and that was the Crabby Patty Melt with Fries and Jamaican Tartar Sauce.. This consisted of two toasted English Muffin halves with a scoop of crab salad and a covering of melted cheese on each one. Served along side were the fries and a small cup of somewhat spicy tartar sauce. We both enjoyed this very much and found the serving size to be plentiful. 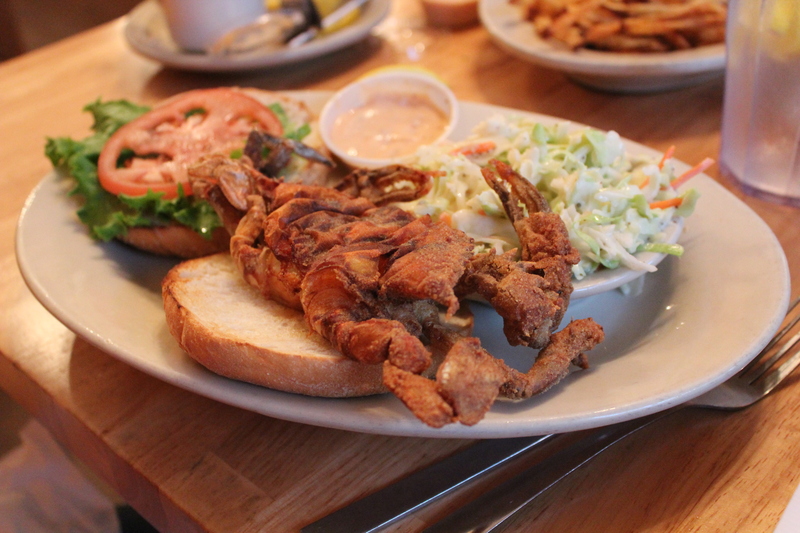 Another member of our party had the Soft Shell Blue Crab Sandwich with coleslaw. The crab was breaded and crispy on a bun with lettuce and tomato, and tartar sauce. She was pleased with this entree and said the crab was tender and flavorful. 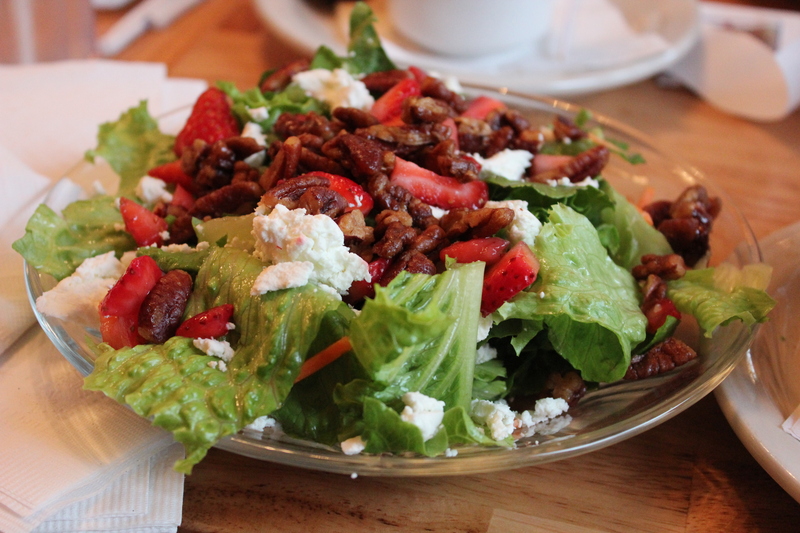 My husband ordered the house salad which consisted of green leaf lettuce, sliced strawberries, pecans and feta cheese. It was beautiful to see and delicious to eat. This was followed by Pan Seared Scallops in Pomodoro Sauce over Angel Hair pasta. 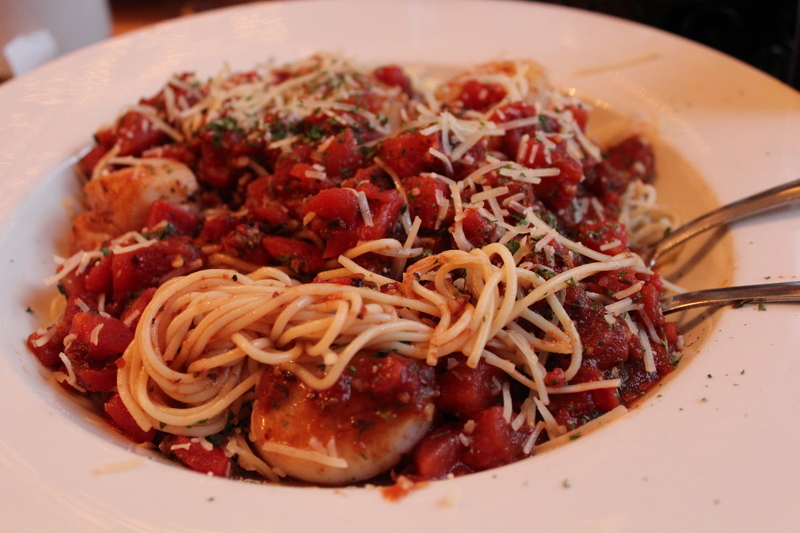 The serving size of this dish was large, with a generous number of scallops that were sweet and tender. The tomato sauce was thin and nicely seasoned, a good compliment to the fine angel hair pasta. He liked his dinner very much, but finishing it was difficult—could it be because he already had a bowl of lobster bisque and a salad? We did not order desserts because we couldn’t eat another bite, but there were several desserts available, all very tempting. 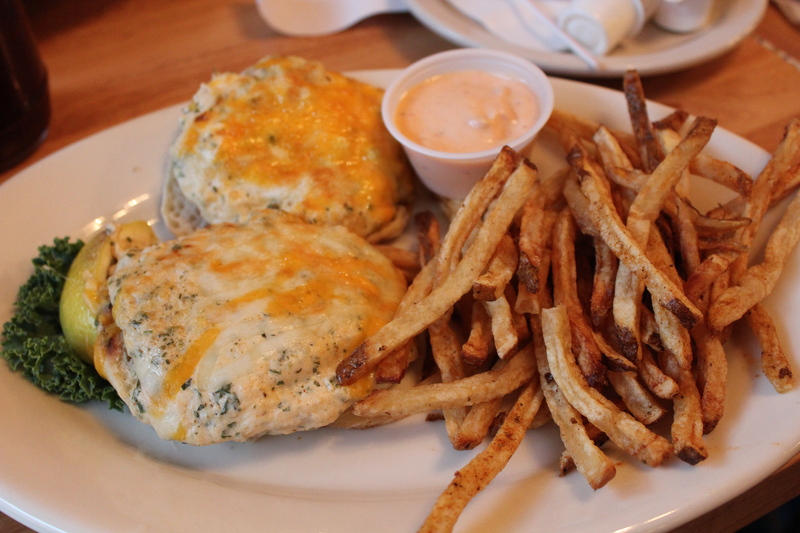 Our impressions of this restaurant: the food was moderately priced, very tasty, with ample portions. Service was prompt and friendly. If I lived in this area, it is a place I would go to for a casual lunch or dinner. Another really great perk: street-side parking is FREE. No meters to put change into, and no time limits. I would definitely recommend M.J’s Raw Bar to anyone visiting New Bern, N.C. or living in the vicinity. Its Not Over Till We Party! A ballroom competition always ends on a high note. That is, we PARTY! A festive banquet takes place on the final evening of a competition. It begins with a cocktail get-together in the lounge outside the ballroom with the ladies in cocktail dresses or long gowns, and the gentlemen in suits. When the doors to the ballroom reopen that evening a complete change has taken place since the dancing ended. Around the perimeter of the room round tables have been formally set for a sit-down dinner. Center pieces reflect the theme of the competition which this time was “The Olympics, since they had just ended; and each dance studio represented a country. Our studio represented some tropical undefined location—it could have been Fiji, Bora Bora, Hawaii——? 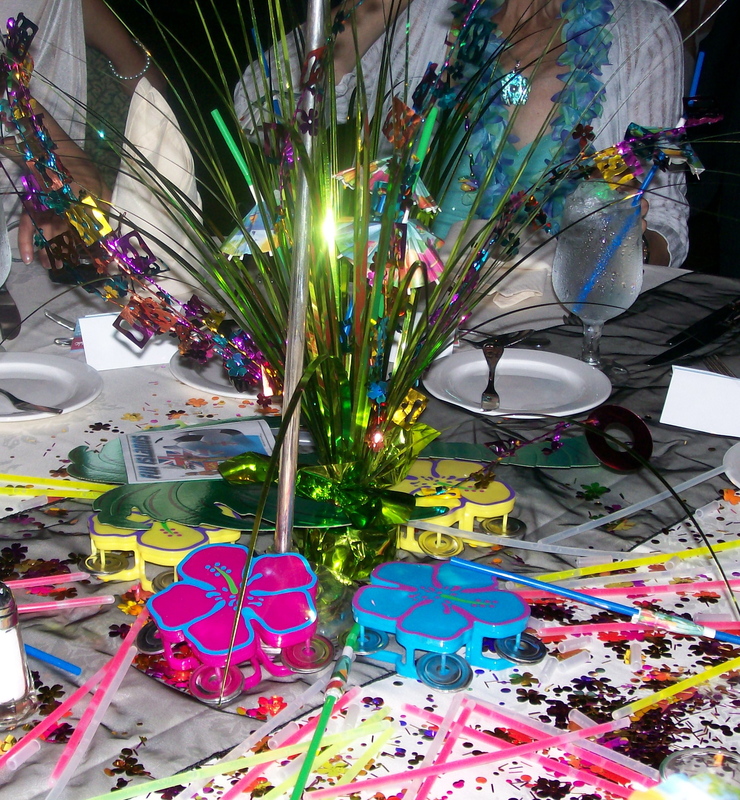 The colorful centerpiece on our table. You would think everyone would have had enough of dancing by then, but not the case. Music starts and couples take to the floor for social dancing. Students, teachers, professionals, amateurs, all dancing with each other, and having fun now that the pressure is off. 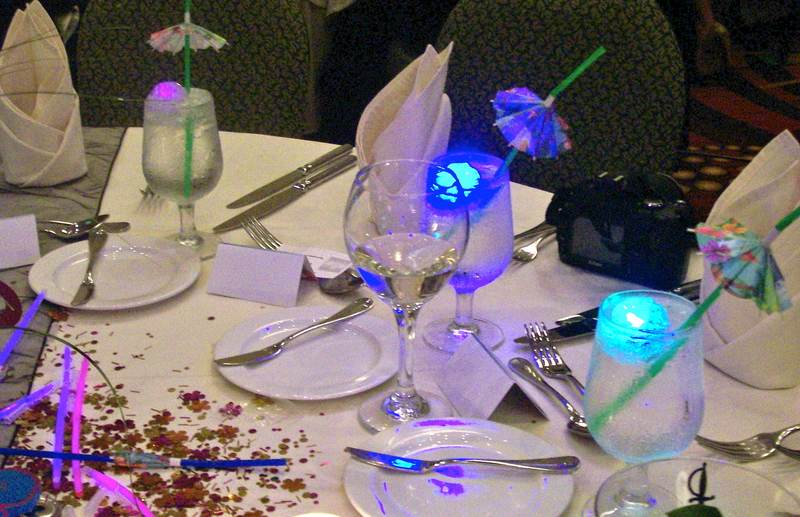 All of the water glasses had twinkling lights in them. So Pretty! The restaurant that catered this dinner was called the Octagon, and is located within the Mystic Marriott Hotel, Groton, Ct. When we made our reservations we chose our dinner selection from three options: Salmon, Filet Mignon, or a Vegetarian entree. My choice was the Filet Mignon. No one at my table had the Vegetarian meal, so I don’t know what it was, or how it was. But I will tell you about the other two entrees. 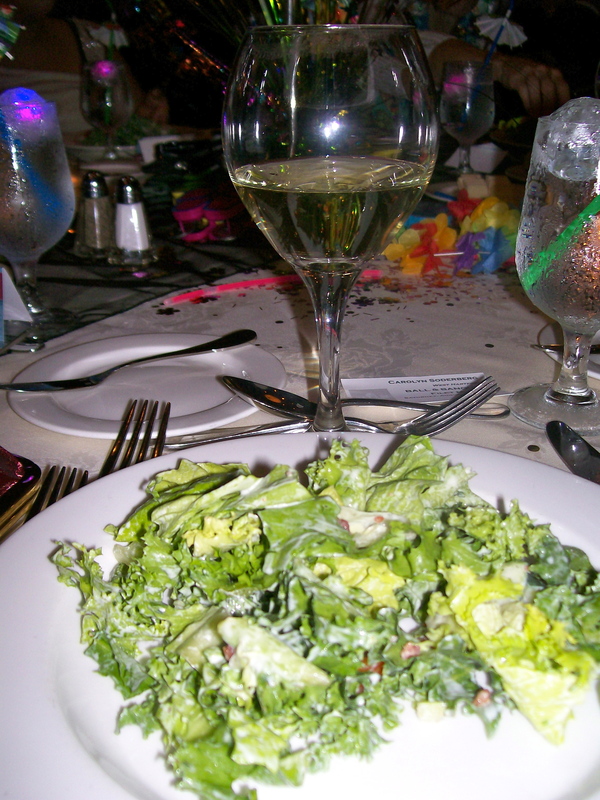 The first course that was served was a green salad. It consisted of a mixture of curly lettuces and kale, and also included snipped dried apricots and cranberries. The dressing was creamy like a Caesar dressing except it was slightly sweet. It was a good counterpoint to some of the more bitter greens. I really enjoyed this salad. It was served with rolls and butter. There was a rather lengthy wait before the salad plates were cleared and the main entrees were served. Of course we filled the time with more dancing. My feeling was that there were not enough wait staff for such a large gathering, and it seemed as though the beef entrees came out before the salmon, so everyone at the table did not get served at the same time. When we did get our food it was very good. As I mentioned previously, my entree was the Filet Mignon. 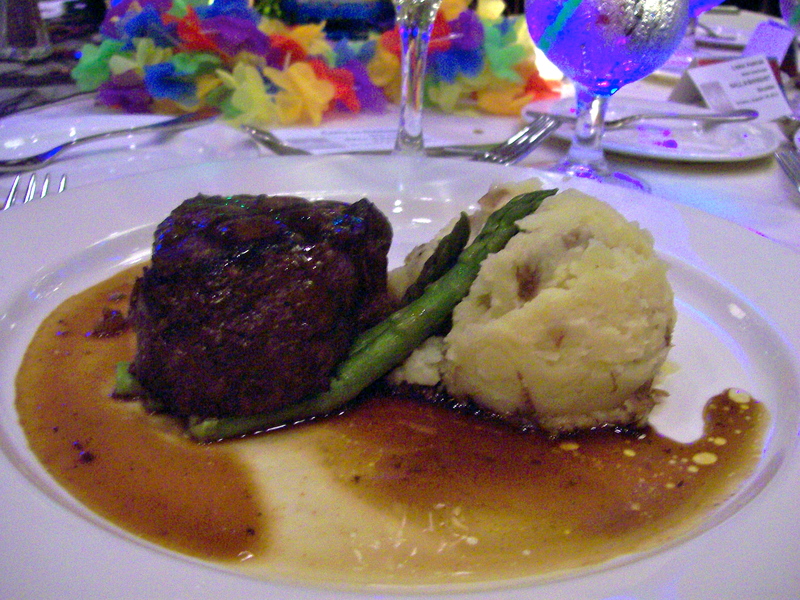 It was served with a brown gravy-like sauce, asparagus spears, and “smashed” red skin potatoes. The meat was so tender, and cooked just the way I like it, slightly rare. The asparagus was crisp tender but the potatoes did not have anything special about them. In fact I only tasted them. 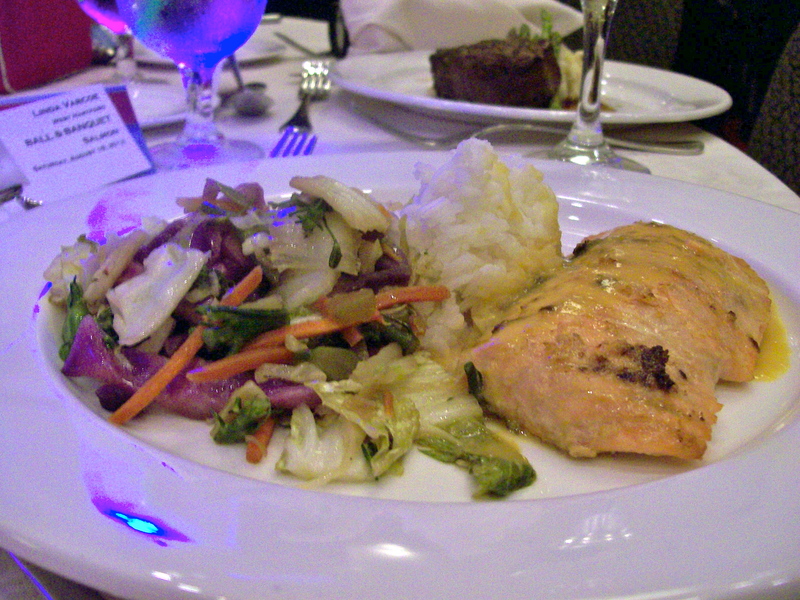 The salmon entree looked very enticing on the plate; served with a scoop of rice and a mixture of vegetables that looked like several kinds of cabbages, i.e. green, red, savoy and carrots. The fish was also cooked just right, flaking easily, and moist. The people who had this dish all agreed it was well prepared and delicious. There was quite an extended wait before the dessert was served. During this time there were announcements, and various awards presented. When the dessert arrived we were delighted to be served a generous wedge of cheesecake. The top had a light sprinkle of what looked like nutmeg, and I think I detected the flavor of nutmeg in the cake itself, although it was very mild. Sadly, the coffee and tea were not served along with the dessert, but came quite a long while later. As luck would have it my camera chose to quit at this point so I did not get a picture of the dessert, but I guess you know what a piece of cheesecake looks like! Before the evening was over we were treated to entertainment by those professional couples who had attained first place in the various professional divisions, and also by a world famous dance couple from Bulgaria who gave a breathtaking performance. More general dancing followed the entertainment until midnight when the wonderful weekend came to a close.